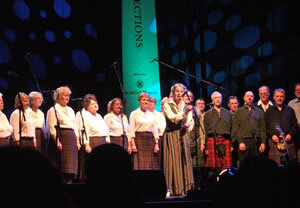 Flying the flag for Scotland, Aberfeldy & District Gaelic Choir joined world-renowned Gaelic singer and folklorist Margaret Bennett for Celtic Connections at the Glasgow Royal Concert Hall on Thursday 31st January. Aptly named “Voices of the World”, the concert highlights also included the legendary Bulgarian women’s choir “Angelite”, and an Italian women’s choir “Coro delle Mondine di Novi”, which originated in the Second World War when a group of women, working in the rice fields, sang to alleviate the drudgery of their work, and smuggled messages and ammunition for the Resistance. The Aberfeldy Choir opened the second half of the concert with Margaret Bennett, having shared a special musical relationship with her for several years, and imparted a distinctly Scottish feel to the evening, singing both in Scots and in Gaelic. Providing a complete contrast to the discordant style of the Bulgarian choir, and the raucously cheery Italian choir, Margaret Bennett chose the evening to introduce her version of an old melody from Padraig Mor MacCrimmon, written in 1650, “Cumha na Cloinne” (Lament for the Children). Margaret explained to the audience that her version, “Fhir an Fhuilt Dhuinn” (Brown-haired Boy), was written by her 88-year-old mother in 2007, and is dedicated to Margaret’s son Martyn, the talented musician and composer who died of cancer during Celtic Connections in 2005, aged 33. With very subtle accompaniment from the Aberfeldy Choir, her lament stilled the audience, which responded with rapturous applause. • Margaret Bennett’s CD “Love and Loss: remembering Martyn in Scotland’s Music” is available from Coda Music 0131 622 7246 or atwww.codamusic.co.uk. All proceeds go to a Scottish Music Scholarship for promising young musicians at RSAMD (Royal Scottish Academy of Music and Drama) in Martyn Bennett’s memory.